Thread: Need Long Arm quilting ideas - It's not talking to me! I made this quilt after seeing it posted on here by another member, I am sorry I don't remember who. I knew when I saw it I was going to make it because it is so happy and beautiful. So now the top is made and I have satin stitched around the pieces - which I don't like to go over when I long arm, personal preference. The problem I have now is how to quilt it. I want to do custom to accent the top and I know there will be a lot of starts and stops that way but I am open to any suggestions - even if it is different from what I am thinking cause this top is really not talking to me! Thanks in advance! Not into long arm quilting, but it would need something special I think. beautiful top but not help with the quilting. You could put either stars or flowers in the center of the circles and then maybe echo around the points. If you like tight quilting on your quilts you could just do a meander stitch around the rest. Its a beautiful quilt. I would do some sort of special design in each circle section- then just echo the points- or a small stipple around the points would 'pop' them out...turned out very nice. I don't long arm, but I would love to see straight stitches from your points to the center of each block and then a pebbling around outside of the points..... same "radiant" stitching in the small circles too. Please post your finished quilt. It is beautiful. How much thread did it take to satin stitch all those pieces? This is such a strong geometric quilt I would go for geometric patterns: concentric circles, points to echo the stars or just straight lines through the centers within each large square. Or wheel spokes maybe? Or to give it a more organic feel, just meander loosely all over. Not into long arm so these ideas might not be easy...In any case, I like the colors, design and would love to see what you finally decide! If the batting you choose is such that it will allow you to SITD around only the colored pieces ... then I would do that and choose various small fillers for the white sections. I'm seeing small ripple lines, pebbling, and stipling in various areas of the white. The outer white border perhaps a simple vine. I would SITD around the whole sun shape in each square. Then I would stitch 1/4 inch out from the outline until it reached the circle. I would straight stitch the circle at the edge of the sun shape. I would do concentric circles in the inner circle shape and in the 1/4 circles on the corners. coachmatthewsvhs - I will put it up when it is done. It took a small thing of thread for each color and a whole lot of time but it sure came out nice. Thanks for your input! Thanks everyone - Lots of great ideas and some that were along the lines of what I was toying with. I appreciate all the great ideas! Winnipeg, MB, Canada and Mesa, Az, U.S.A. I think it would be best to follow the patterns you have there. Make circles within the circles by going inside maybe every 1/2 inch. Lots of circles or overlap various size circles in the middle. For the outside points of the stars I would echo those also. Maybe again every 1/2 inch. I don't do long arm but use my home machine to quilt all my quilts. I think it would be best to follow the patterns you have there. Make circles within the circles by going inside maybe every 1/2 inch. Lots of circles or overlap various size circles in the middle. For the outside points of the stars I would echo those also. Maybe again every 1/2 inch. I don't do long arm but use my home machine to quilt all my quilts.Pops I'm just now looking at the date. I guess you have quilted already! I love how happy your quilt looks. You have put a lot of work into the piecing. It is a busy quilt and I would not put intricate quilting on it. No idea here because I too am not a long armer, but please show us when it is done. It is a very happy, bright quilt. I like Tartan's idea. #9. Good luck. It's a very bright and cheery quilt. I like it alot. Make sure you can come in close some of the details of the quilting is pretty amazing. One quilting class I had showed how different lines create a peaceful look--horizontal lines-where diagonal lines tend to be more exciting. I think the centers, I would think about horizontal lines, separate to each quadrant. The points maybe a flame type stitch. The outside quadrant circles you could do like the center, or make them like sun rays coming from the center with a s like curve. The outer areas of the points you could do echo stitching, with some type of meander on the outside negative areas. Personally I think it is easier to try to figure out each area, then to just say, make a flame meander throughout. 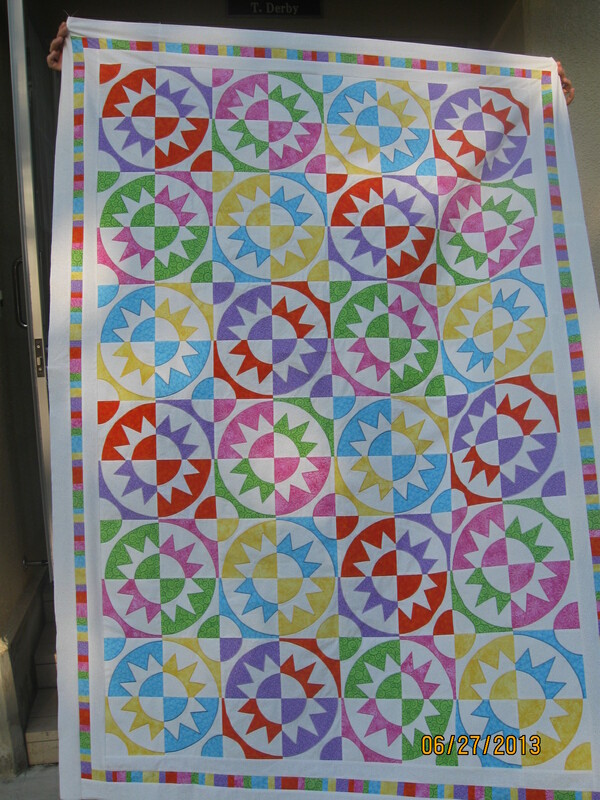 Try taking a piece of vinyl that you might put over something--it is sold at fabric stores, or even a clear piece of overhead projector sheet and using a vis a vis marker mark how you might do the quilting. If you like it keep it until you quilt it, as a reminder, otherwise windex it off and on to the next idea. Last edited by Pepita; 06-29-2013 at 07:28 PM.